Adventures in Mississippi: So you think you can blog, huh? I'm Erin. I'm in Mississippi. I have no idea what I am doing here. Well, I have some idea. I came down here to work with the Presbyterian Church in response to Hurricane Katrina. It started as a simple online resume tossed out into Internet oblivion and became a lifestyle in just a matter of weeks. I'm still a bit confused about the process, but I have no doubts about my call to service. There is so much work to be done here and I just know that I can contribute, somehow. I arrived on the Gulf Coast on September 5, 2006. Since then, I have been calling, emailing and writing letters to family and friends, basically saying the same thing to each of them with every message. This blog, I hope, will streamline some of those efforts. But don't worry- I still miss you all like mad, so the phone calls and written contacts will continue! Did I mention that I miss you? I do! Lots! And all the time. Like mad, I say! So, most of you have already heard of my travels down to the South, the week of orientation in Biloxi, my case of homesickness, and all of the fun people in my program. We moved into Handsboro Presbyterian Church on Sunday, Sept. 10th. Handsboro is a great old church in Gulfport, MS. I live in the building behind the church in office space that has been converted into bedrooms and a large living room. I live with 5 other volunteers- 2 male and 3 females. They are good folks from all different backgrounds, which will definitely make this a year for learning and growth. The goal is to live in an intentional Christian community in order to explore our relationships with God, ourselves, and others. I am excited about this process and where it will take me in my spiritual journey. The job piece of this puzzle is still a bit fuzzy. When we arrived, there was a mad panic on to finish some work on the manse (the house next to the church in which the pastor and his family will live). 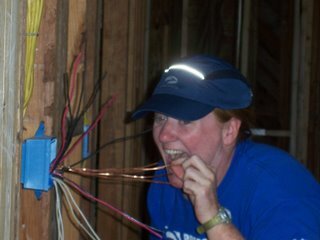 So I learned construction and spent nearly two weeks pulling electrical wire and putting up drywall. It was hard, sweaty work and I now have the man-hands to show for it! But it was fun to finally be getting something done. And I did take some pride in showing these southern gentlemen that real girls get dirty and get the job done! We've managed to sneak some fun into the trip already too. We went to New Orleans the first weekend here to celebrate the 21st birthday of one of the girls in the group. Then my team of 6 went to the Biloxi Seafood Festival with some friends, where we enjoyed good food, local beer, and some rockin' zydeco music. This weekend we plan to make a road trip to Pensacola for some serious beach time! I am still trying to figure out what I am doing here, how I can contribute and how to live in a church for a year with five other people! But I am inspired every day by the generosity of strangers and the faith of my new neighbors. Did I tell you that I have yet to cook a meal for myself down here. There is a church in northern Mississippi where the ladies cook casseroles and supply them to Handsboro in bulk. Yesterday, a man drove up with 40 casseroles in his trunk. Seriously, I may never cook again. So, when I don't have casserole on the brain, I will try to keep this blog thing updated with my latest thoughts, experiences and adventures. Please check back and feel free to comment (I think that is how this works), but go easy on me because I am a newbie! Welcome to the age of technology! I hope you enjoy your stay here. Thanks for the update. A blog is a great way to give us all the info we so desperately crave about how you are and what you are doing. Please keep it up...please. Erin--as always, your writing and passion inspires me and I so admire your sense of adventure. I think the blog is a fabulous idea and I look forward to reading future adventures. On a fun note--once you get the construction thing down, you can audition for Extreme Makeover! Thank goodness. I thought I might have to make a couple more bulletin boards to hold all the postings from the various people who'd get updates from you. This is my first time to visit Blogdom, too. I guess we all can't be as hip and totally technologically cool as the clergy seems to be. Very cool! I'm glad that I can logon and check in to see what you're up to. I always like the photos too. Hey - this is neat. I think I can do it. Erin, I really enjoy reading your words of wit and wisdom. You are the greatest. Keep it flowing.